Greetings to you in the Name of our Lord and Savior Jesus Christ. What a privilege to be alive at such a time as this and to serve our Lord in these Last days. We are located in Karimnagar district of Andhra Pradesh, in Anantharam village. The Church began in the year 1970 with few members. My father was pasturing the Church then. In the year 1987. I became the Pastor of the Church, and we’ve been serving here since then. In the Gospels we read that Jesus ministered in the slums and villages and towns. It shows us the great value He placed on the souls of people. His desire is that none should perish. We have an amazing congregation in Karim Nagar that is excited about their life in the Lord. Most of the congregation is made up of daily wage labourers, stone breakers, coolies, carpenters, brick makers, farmers, etc.. Most of them are illiterate, but after accepting the Lord as their personal Savior, God has helped them to study the Bible. Currently we minister in 9 villages surrounding Anantharam. The main Church is in Anantharam. 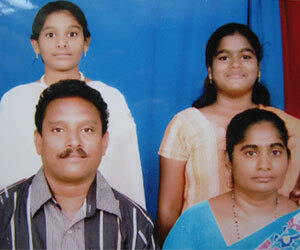 Our vision is to raise up disciples, and reach the many unreached villages and towns of the state Andhra Pradesh. Finances for a new meeting hall with our house attached to it, in the plot of land which was given free of cost by the Government. New souls to be added to the Church. We believe Bible is the answer for every man’s life. We are thankful to God for the way He is using in this place. His Grace is truly sufficient for us.